The New Alliance ICT Extension Challenge Fund project, known locally as e-Extensão, will use communication technology—such as mobile phones and radio programs—to disseminate key food security and agricultural technology information. Radio programs, building off successful Farm Radio International (FRI) programming. Programming will contain information about improved techniques, promote the use of quality seeds and other inputs and provide up-to-date market information on key crops such as maize, soy, cassava and orange-flesh sweet potatoes. 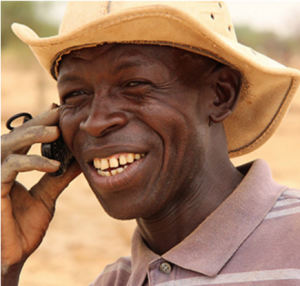 A farmer celebrates the cell training network at a launch event with Vodacom officials. Complementing traditional agriculture extension services through NCBA CLUSA’s lead farmer network, private sector and government extension services, the project works in partnership with Vodacom, which has agreed to support the project in reaching 5 million cell phone subscribers. The New Alliance ICT Extension Challenge Fund is an enabling action of the New Alliance for Food Security and Nutrition, and focuses on reaching more smallholder farmers with ICT-enabled extension services to support their ability to adopt new techniques that can increase productivity. “Using communication technology to disseminate key agriculture trainings, such as the improved benefits of conservation agriculture, will only make our current extension work in Mozambique more effective and able to reach a broader audience,” said Carolina Reynoso Pieters, NCBA CLUSA’s Country Representative in Mozambique. NCBA CLUSA is committed to reaching rural women and other marginalized farmers, such as youth and the non-literate. Almost all the population of Mozambique has access to a radio, making it a popular source of information, and cell phone ownership has doubled in the past five years. Multiple feedback mechanisms have been put in place, such as the Vodacom sponsored toll-free eedback line and FRI’s tested beep-to-vote system, to ensure that all farmers’ voices are heard both in the development and refinement of technical content. The content will be developed in partnership with the Mozambican Ministry of Agriculture and Food Security (MASA), the Scaling Seeds and Technology Partnership (STTP) and NCBA CLUSA. 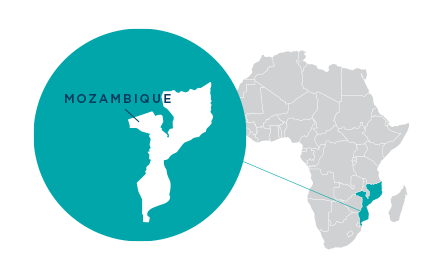 Mozambique is one of six countries with ICT extension challenge funding, targeting a total of four million farmers across Africa.